Montréal, QC, Canada — October 3, 2018 — Sanexen Environmental Services Inc. (”Sanexen”), a leading environmental company and part of the LOGISTEC family, announced today that it will receive $1M CAD from Sustainable Development Technology Canada (”SDTC”). Sanexen will direct the funding to demonstrate the next generation of trenchless structural cured in-place pipe (”CIPP”) technology for water main applications. The funding from SDTC will allow Sanexen’s Innovation team to advance its unique seamless structural water technology with much improved strength and a unique ability to adapt to host pipe. With SDTC support, Sanexen aims to build on its original Aqua-Pipe® technology, a proven trenchless alternative to conventional dig-and-replace methods, for the renewal of underground water mains. To achieve this goal, Sanexen has initiated an ambitious demonstration testing program at Cornell University. The work at Cornell University will focus on research and large-scale laboratory testing conducted at the Cornell Large-Scale Lifelines Testing Facility and will be performed in partnership with US and Canadian water utilities. Cornell has developed a protocol for large-scale testing to evaluate and quantify pipeline performance during extreme events. “Sanexen is a great example of Canadian cleantech innovation that SDTC is proud to support. By thinking outside of the box to find a more cost-effective way to rehabilitate water mains, the company is contributing to better water conservation, all while reducing the environmental impact of their actions.”, said Leah Lawrence, President and CEO, Sustainable Development Technology Canada. 2018 is a pivotal year for Sanexen as it expanded its global presence into new states in the U.S. Sanexen is also entering new markets, such as Australia. “We’re proud to play a role in such a meaningful industry, working closely with cities to deploy our proven technology across communities”, concluded Madeleine Paquin, President and Chief Executive Officer of LOGISTEC Corporation. SANEXEN, part of the LOGISTEC family, is one of Canada’s leading providers of environmental solutions including site remediation, manufacturing of woven hoses and trenchless structural rehabilitation of underground water mains. From the onset, Sanexen has assisted industrial, municipal and governmental customers in dealing with environmental issues to deliver optimal value solutions that are best adapted to their needs. Over the past 18 years, Sanexen has developed considerable expertise and an impressive intellectual property portfolio with respect to its innovative Aqua-Pipe® technology for the rehabilitation of underground water mains. Sanexen has installed more than 1,600 km of its Aqua-Pipe® Trenchless Structural CIPP Technology in over 350 cities in North America, helping them improve their water main network performance and reduce their maintenance costs. 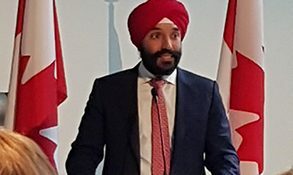 SDTC is a foundation created by the Government of Canada to advance clean technology innovation in Canada by funding and supporting small and medium-sized enterprises developing and demonstrating clean technology solutions. Cornell University is a private, Ivy League university and the land-grant university for New York state. Cornell’s mission is to discover, preserve and disseminate knowledge, to educate the next generation of global citizens, and to promote a culture of broad inquiry throughout and beyond the Cornell community. Cornell is helping the water industry to develop the next generation hazard resilient pipelines and underground infrastructure for enhanced performance after earthquakes, floods, hurricanes, and events that cause ground deformation and undermining of buried water mains.